This is a work of fiction. Names, characters, businesses, places, events, locales, and incidents depicted in this story are either the products of my imagination or used in a fictitious manner. Any resemblance to actual persons, living or dead, or actual events is purely coincidental. This story is based on a true story of each of us. Over the past 10 years, many web developers have experienced such a journey. 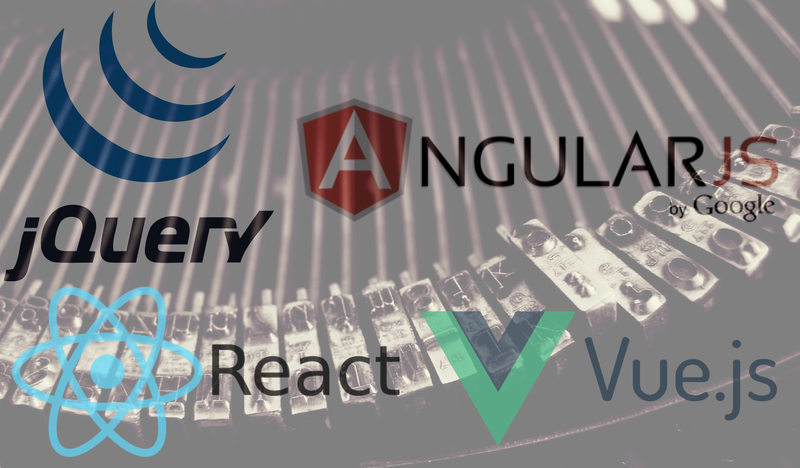 Starting from jQuery, passing through Angular, using React and streak Vue. When reading, “darker areas” of the beginnings of single page applications (SPA) are undergone. This can cause unwanted nervous muscle twitches from the past. For risks and side effects read the package leaflet (there is none) and consult your doctor or pharmacist (I don’t know if they could understand). Once upon a time, in spring 2008 in a small company in Sheffield, there was a software developer called Dorian. He was working on a desktop application built with Microsoft .NET. Not far from there, in Rotherham, Shaun worked in a similar company as web developer. Both companies were very similar and sometimes even had the same customers. So it happened that the top management of both companies met and they merged. Patty, who had been promoted to development manager, had the task to assemble a new web development team. After she had already inducted Shaun into her team, she also found Dorian and noticed a possible team change. She beat him an offer and Dorian joined straight the team in Rotherham. Patty saw the first weeks relaxed and felt that she was uniting these two, the right thing. Soon it was time to productively implement a new web application. Together, they decided to try to use node.js in the backend and jQuery in the frontend. Since the web application was not only for English speaking users, they used jquery-i18next as an internationalization (i18n) library. To see how this could look like click here. After about 3 to 4 years, the first signs of weakness of the web application began. There were overusing big/clever plugins, had big/complex files and polluted the global namespace. The heavy use of long chains of selectors (“ul#leftnav li p a.current“) made the code brittle. They started to lose track of what’s where because of the neat idea to use .data() to attach data to the DOM elements, to track the page state. Patty had new major features in the pipeline. But the team, which had problems to grow, recommended a refactoring phase. Quickly the team got support from 2 freelancers, Serge and Martina. Patty introduced the new ones as “the experts”. Serge and Martina had Angular know-how and persuaded everyone to replace the jQuery solution with Angular. From semantic HTML, to semantic models. Instead of classic separation of concerns (HTML, CSS, JS), the usage of MVC pattern. No plug-ins but directives. $scope instead of closure. Instead of manual DOM manipulation and binding, modern data binding. Less “spaghetti” code and more dependency injection. From unorganized, to modular service architecture. Because i18next was not only built for jQuery, they could use ng-i18next and at least keep the same configuration and use the same localization files as before! During the next 3 to 4 years, Patty added more freelancers and contractors to the team. Shaun and Dorian started to recognize that making the simplest features work seems a struggle. There were more and more performance and complexity issues. Directives, services and filters theoretically were available, but ultimately, everything was built around controllers and their two-way bound $scope. Angular seemed to be fine for the beginning, when it was a simple application, but as the frontend application grew in complexity, this led to the scope soup problem amongst other issues. In the meantime, the backend had turned into a solid foundation based on DDD, CQRS and event sourcing. During a late-night beer, Dorian told Shaun about React and Redux. He said that when he read about React, Redux and FLUX he immediately felt that this was a natural fit to the existing backend. React has faster learning curve. It feels like learning faster. As with the last technology change, this time there was an i18next option. Just used the new react-i18next library and still the same localization files! Whether they’ve really switched to Vue, we do not know, but what we know is that if that’s the case, then they’re sure to use vue-i18next or a similar library. “learn once — translate everywhere”! Technologies and libraries come and go, but i18next remains! There are voices who say that they have also replaced their i18next-xhr-backend with that of locize. To see how this could look like look at this video.